By no means do yo need a Cricut machine for this project, it just made it a little easier for me. Here are step-by-step instructions on what I did. Now, I will say, I did not follow the exact directions from the maker*land blog because I did not incorporate the sewing machine into this project. First, I ironed my fabric onto the iron on adhesive. Once ironed on, I placed the fabric with the adhesive onto my Cricut mat. NOTE: DO NOT REMOVE THE BACKING FROM THE IRON ON ADHESIVE!! Next, I cut out the chosen design out on my Cricut. I just picked a simple design from the Ribbons and Rosettes Cricut cartridge. I set the pressure to HIGH on my machine and put the depth at 6 (I used the older Cricut Expression model). I also chose for the crown to be cut out 3 times. This is much easier to do if you are familiar with the Cricut Craft Room. Once the design was cut out on the fabric, I peeled the fabric off of my mat. This is when you can remove the backing from the adhesive. Next, I cut the same design out on the Cricut again, this time, using the piece of card stock. I chose a coordinating color to go along with my fabric pattern. After the card stock was cut out, I ironed the fabric piece onto the card stock. The Therm O Web adhered great to the card stock! Now time for the assembly! 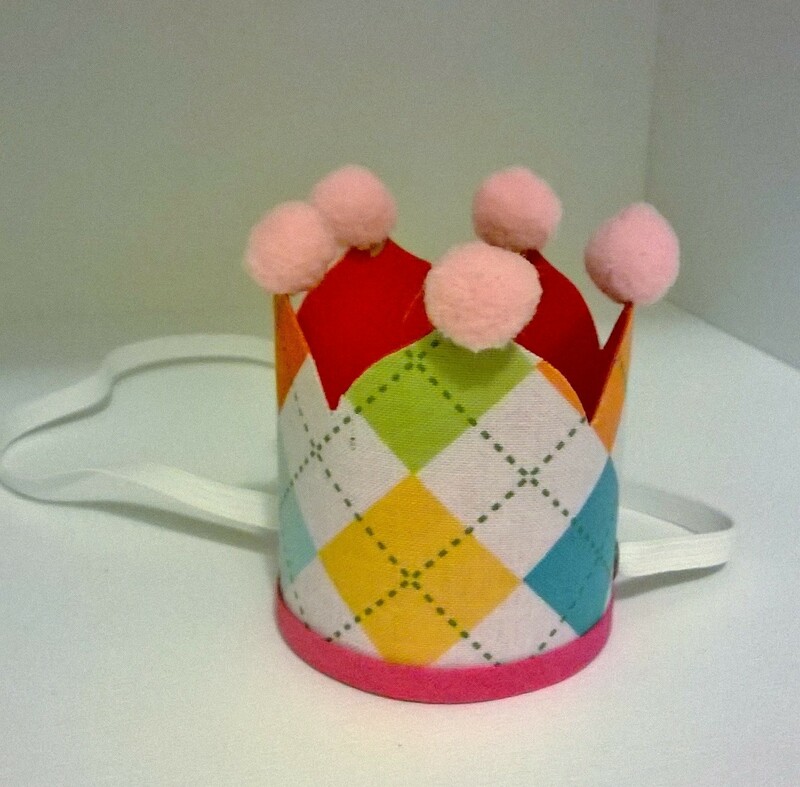 Using the tacky glue, I glued on the bias tape around the bottom portion of the crown. The tacky glue dries fairly quickly, and you don’t need to use much. If you’ve never used it, I highly recommend trying it out! 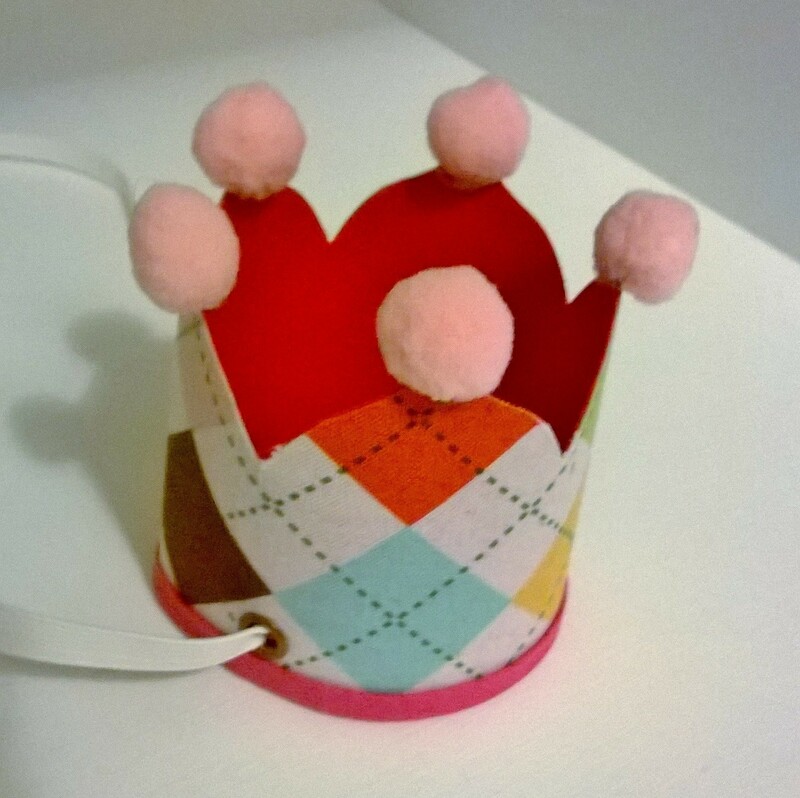 Next, I pulled the crown together to attach one side to the other to form the actual shape of the crown. I also used the tacky glue to secure it. Using the Crop-A-Dile, I punched a hole on either side of the crown, then inserted the eyelets. Once the eyelets were in place, I put one end of the elastic into each hole from the front of the crown. Once the elastic was in, I pulled it through the top to tie it off. 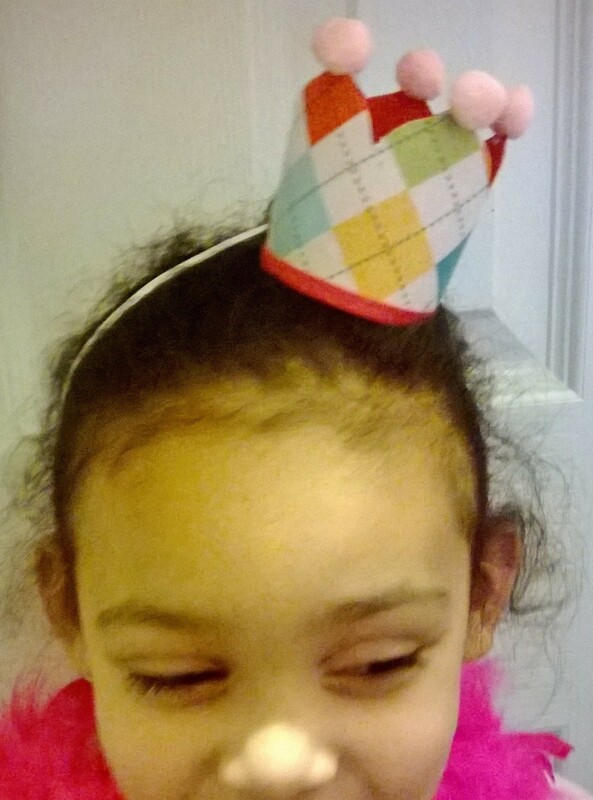 Finally, we added Pom poms…I said “we” because this was pretty much the only part that my child actively participated in 🙂 …besides the wearing of the crown! After re-reading this post, I can totally see why it seems like this project took a lot, but it really didn’t…as long as you have all of your supplies together at the beginning of the project. I have to admit, this was my first time using the Cricut to cut fabric, and I was quite impressed. I’ll definitely be doing other projects using this technique. I did read somewhere that the backing from the iron on adhesive helps the fabric to stick to your Cricut mat without ruining it. The mat that I used was a little worn, so I taped the sides of the fabric on the mat to make it extra secure. So, what do you think?